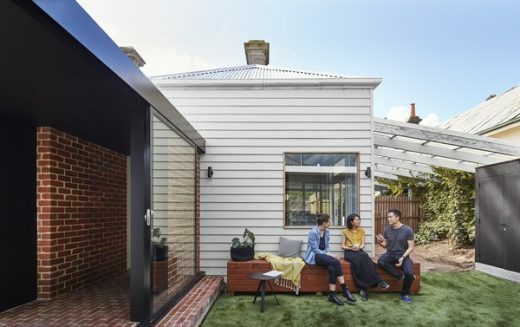 The client approach MODO Architecture with a brief to renovate their double fronted cottage in hawthorn, after a few briefing session with the clients, it became very clear that their lifestyle revolved around their garden and spending their days outdoor as much as possible. 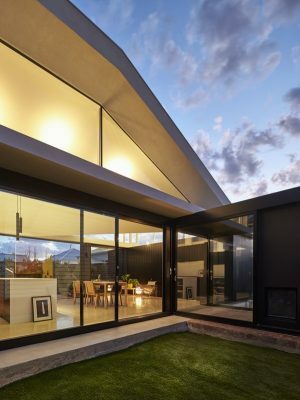 Unfortunately, their existing house doesn’t utilise the exterior as well as it could, and being completely south facing, the central body of the house remains quite dark most of the year. 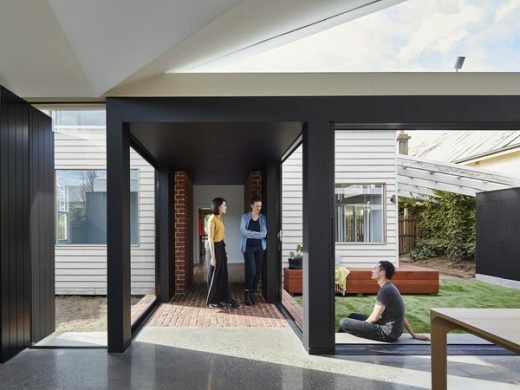 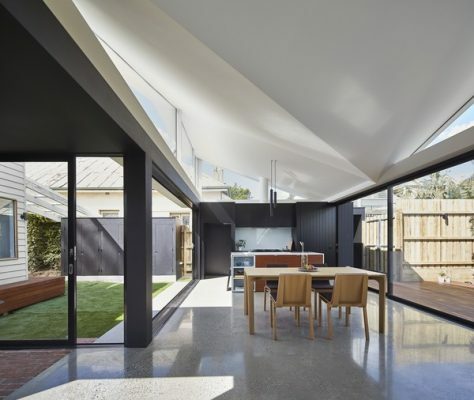 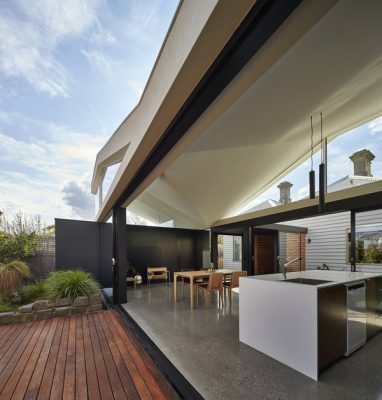 So MODO Architecture’s first approach, was to remove the awkward rear lean-to and instead of extending from the existing house, we decided to build a stand alone structure o the front house and connect the two spaces with a central passageway. 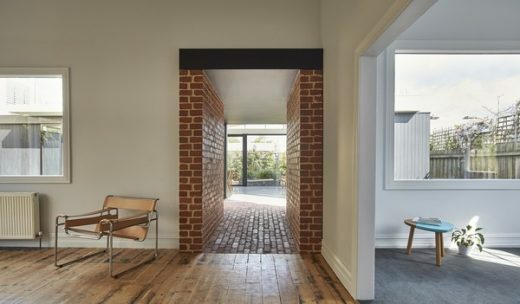 Conceptually, this allows the two built form to contrast their individual form and characteristic, creating an architecture that provides clear distinction between ‘old’ and ‘new’. 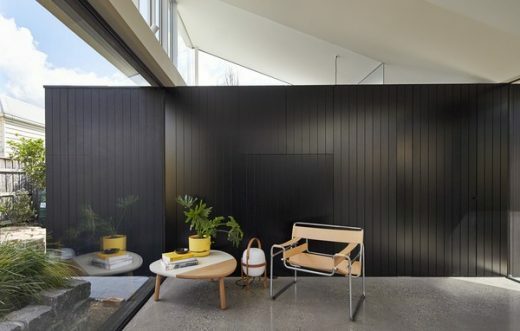 Spatially, the new stand alone living at the rear opens the central body of the site to create a north facing courtyard, with this planning strategy we now have a new north facing rear living area, natural light into the ‘darkest’ spot of the front house and an active garden courtyard. 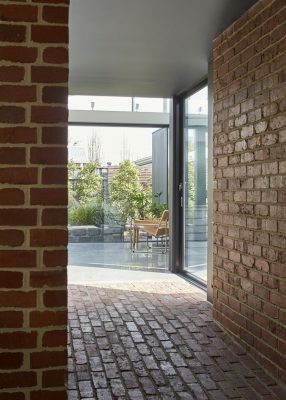 The new living area is now nestled between the rear garden and the new courtyard, creating an architecture that now physically embeds the clients in between the garden, where previously they were only next to it. 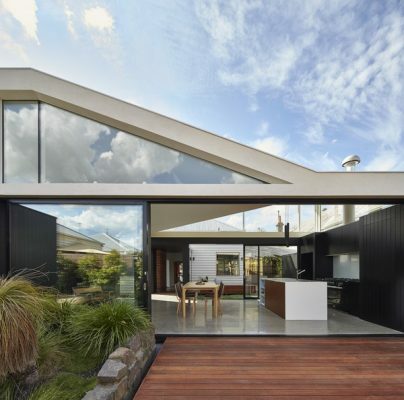 MODO Architecture felt this approach not only respected their interest and lifestyle but hope it will also enhance it. 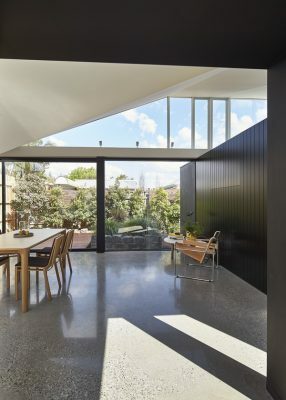 The new addition consists of a kitchen, pantry, dining, living, bath and laundry. 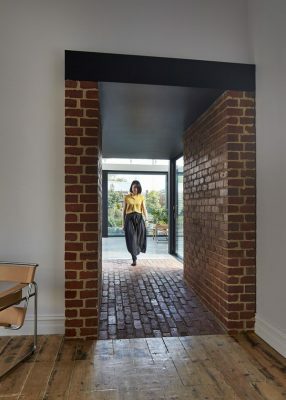 Unlike the brick tunnel, the concept of the addition is to borrow qualities you may find in a park pavilion. 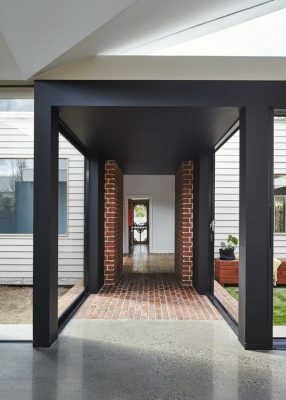 Rather than creating a wall space with windows and doors punched out, MODO Architecture decided to mirror it and place objects (black boxes), lines (structure) and planes (roof) to hold the space, with the spaces between glazed. 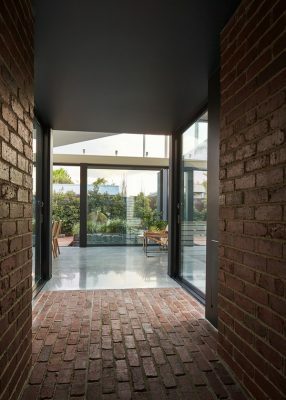 By reversing this approach, we visually open the living areas to the garden, the ‘walls’ are now the garden itself, which subtly changes throughout the day, evening and season. 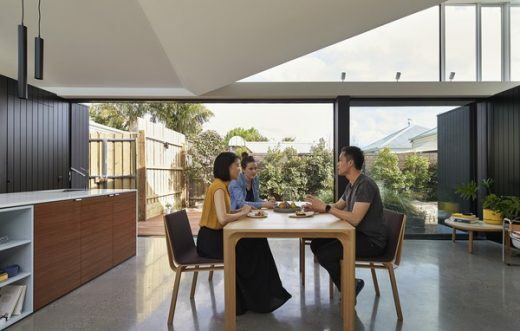 The roof form kicks up form an asymmetrical buttery roof, the combination of the raked ceiling and high windows softly diffuses the natural light down into the space and to gently lift the space up. 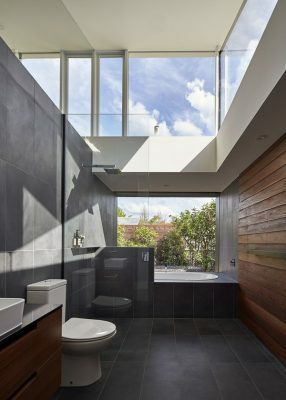 The ceiling continues to diff use light in the evening, a set of track lights are designed to bounce light back down into the living areas, the ceiling helps to soften the light while also create quite a sculptural element in the evening.